Hey, friends! I hope everyone is well. I have a cough that just won’t go away. It’s just a little scratch at the back of my throat that makes me sound like I’m trying to get people’s attention every 5 minutes. Ahhheeemmmm. Anyway! Today, I have something really lovely to talk about. I have been following Meredith Crawford’s blog, One Sheepish Girl, for a little while, so when I was asked if I wanted to review her new book AND have a giveaway on the blog, I immediately responded with a “heck yes!” Not my exact words, but you get the idea. First of all, this book is a thing of beauty. The photos are gorgeous and the projects are all bright and pretty. My FAVORITE aspect of the book, though? The table of contents! Recently, my son has asked to read the table of contents for any book we are starting. It was kind of weird at first, but now it’s part of our routine. It’s nice to know what’s coming up and in this book, you can SEE everything. I loved that. 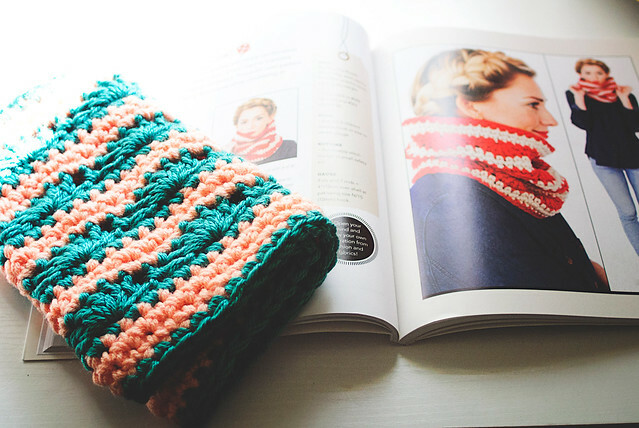 The first part of the book includes a sweet introduction and then some very detailed instructions for crocheting. There are directions for the basic stitches you’ll need to know, changing colors, finishing, embroidering, surface crochet, blocking, and even sewing in a zipper or liner! All have step by step photos and instructions. That alone makes it a great gift for new crocheters. I would have loved to have this when I first started. I’ll definitely be referencing these when I get around to working with zippers (I’ve been crocheting for 8-ish years and they STILL scare me). The rest of the book is the patterns, divided into three categories: WEARING, LIVING, and, GIVING. 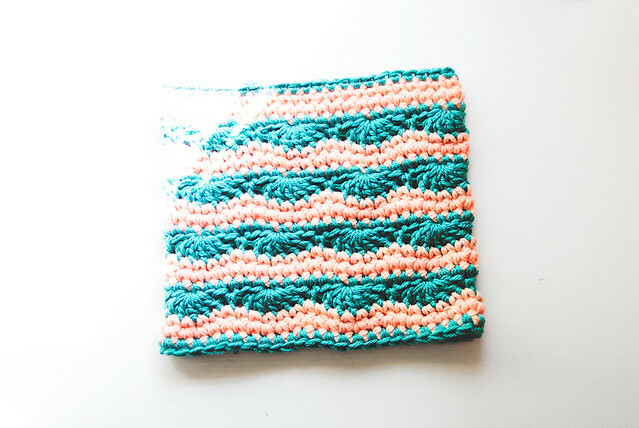 It’s pretty easy to find something to crochet for any occasion. I went through the book several times to figure out what I wanted to make for this post. 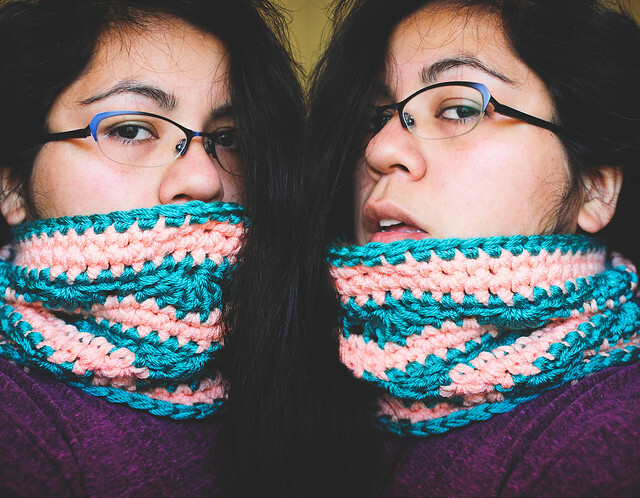 I chose to crochet the Scallop Stripe Cowl. The pattern calls for super bulky yarn, of which I didn’t have in colors I loved, so I used two strands of worsted weight yarn. I used the same hook size (N) and it worked out nicely! The instructions were very easy to follow, though I would have liked to have a stitch count at the end of rows. That’s just a personal preference, though! I think this pattern would be very easy to adjust to work with different weights of yarn. The stitch pattern is simple enough to memorize and work while you’re watching a favorite TV show or listening to music/books. Now, if the weather here in Houston would cooperate with my yarny desires, it’d be cold enough to wear this regularly. Just wearing it to take the photos had me super cozy, on the verge of a sweat. If you are interested in the book, you can find it on Amazon and Barnes and Noble! Perhaps you can buy one for yourself, then try and win one for a friend? Enter the Rafflecopter giveaway below! No purchase necessary. Open to residents of the US and Canada only. Giveaway ends October 30, 12am. Looks like a great book! Thank you for the chance! I have been eyeing this book online. Such beauty and great work! Looks like a awesome awesome book ;) Thanks! I would LOVE to win a copy! One Sheepish Girl is one of my favorite blogs! I love the colours in the patterns. Everything looks so pretty! That scarf pictured is super cute! Love this. 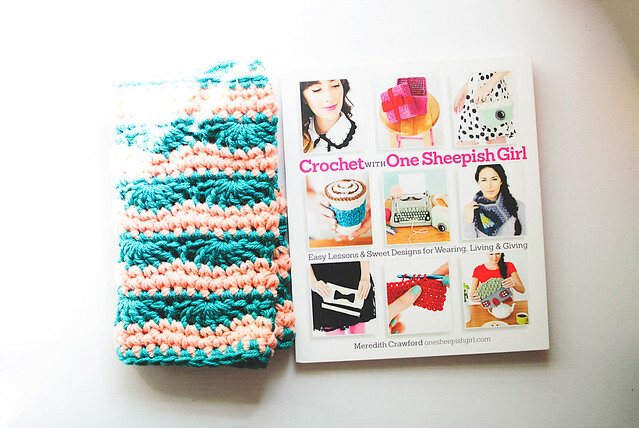 The book looks amazing and I definitely need a new crochet project! Book looks fantastic, would love some news projects! Been following Meredith for some time, this is so exciting! Hello! That book looks amazing! What a great book! There are so many things I’d like to crochet. Thanks for the giveaway! I now know of a new crochet blog to follow, great! Your book looks amazing. I am so glad that I found your blog through the give away. I will definitely be following your awesome blog. Thank you for the chance to win a new crochet book. I would love that book. It looks great and I can crochet a little but it would help me be so much better. Hello! I would absolutely love to win this book! Thank you for the opportunity. Beautiful book! Excited to see her success! I’ve been waiting for the weather in Los Angeles to cool off enough to wear my scarves too! I would love to win this book. The Teacup coasters and so many other patterns look so adorable. This looks like a great book. Thank you! That is beautiful! I have been pining over this book since we first heard about it! It looks lovely! This looks like a great book with lots of gorgeous gift ideas. Thanks for the giveaway. I’m super excited about this book, thanks for the chance to win a copy! Lovely blog here, glad I hopped over and I will be back. 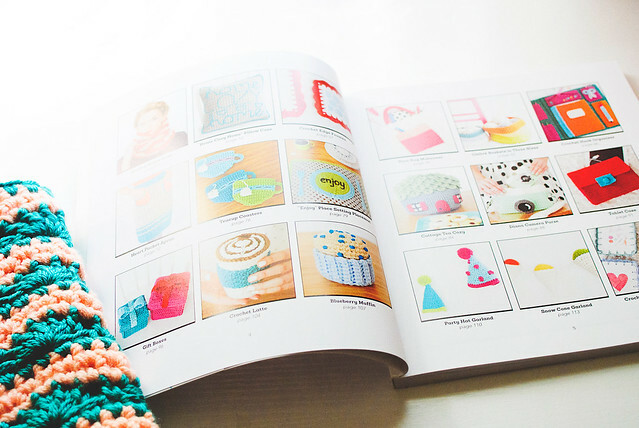 I like learning new patterns; this crochet book would be perfect for me. What a fresh looking book! Hello! Sounds like a good book for a beginner like me. Hi there! 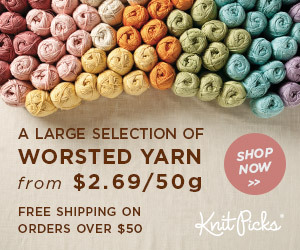 This is just what I need to get me back into crocheting! Wow those colors are gorgeous! Very nice match of colors! I did already 3 scarves of the One Sheepish Girl book. I love it!